Why the Democrats need Keith Ellison. The candidate for DNC chairman wants to lead an anti-Trump resistance, not search for areas of cooperation. 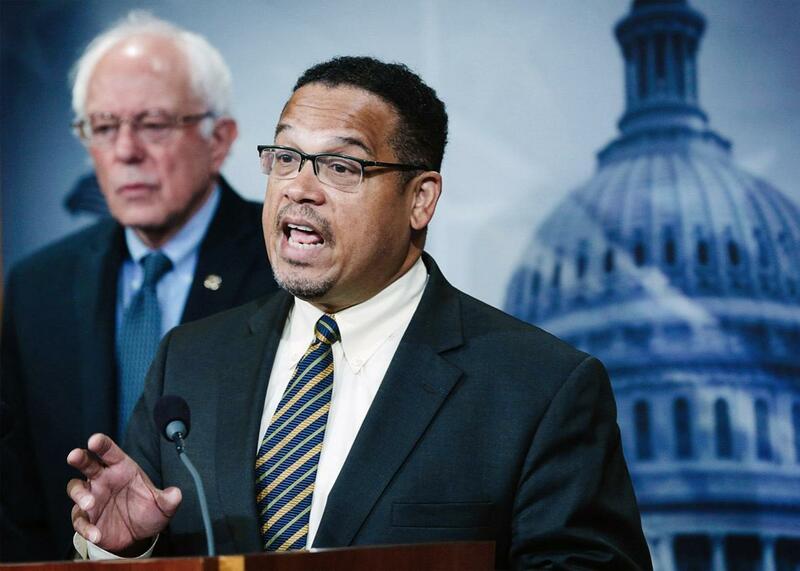 Rep. Keith Ellison speaks to members of the media as Sen. Bernie Sanders looks on during a news conference on Sept. 17, 2015, on Capitol Hill in Washington, D.C.
It’s easy to see why Sanders feels vindicated right now. The election did not prove he could have beaten Trump, but it proved that Clinton, who made her case partly on electability, could not. Nevertheless, it was shocking to see him take this conciliatory tone toward Trump, treating him as a man with a common set of values. As much as Sanders wants to represent the beleaguered white working class, the people who really need a champion now are those under direct and imminent threat from Trump and Trumpism. So far Sanders has shown himself unable or unwilling to lead the anti-Trump opposition, except in one way: by pushing Keith Ellison for Democratic National Committee chairman. Howard Dean, who led the DNC from 2005 to 2009, is running against Ellison to get his old job back. His analysis of the election actually sounds a lot like Sanders’: “What this was was basically a populist revolution,” he said on NPR. “Luckily, we have a democracy here, so nobody got killed. And you saw a lot of people who have been left behind in globalization and they’re unhappy about it.” Dean was a very good DNC chairman, but as a strong Clinton backer, he doesn’t have the same sort of credibility with young, grassroots activists that he did 10 years ago. Unlike Ellison, he can’t serve as a symbol of the party’s future, and he’s not properly articulating the peril of the present. Right now there’s a howling need for leadership among Democrats. More people cast votes for Democratic Senate candidates as well as for the Democratic presidential candidate, yet because of the way our system advantages rural voters, this majority has no power in the federal government. “Every day for the past week, the majority of American voters have awakened to a difficult reality,” Nevada Sen. Harry Reid said in a floor speech on Tuesday. “Not only did the man who lost the popular vote win the election, but his election sparked a rise in hate crimes and threats of violence.” Reid is one of the few politicians speaking for this majority, but he’s about to retire. The people who are terrified by Trump’s victory—not white working class Trump voters—need Democrats to represent them. They need politicians who will see them, acknowledge their horror, and fight to muster whatever still exists of our democratic institutions on their behalf. The job of progressive leaders is to say no to Trump, not search for areas of cooperation. There are many arguments one could make for why Ellison should be DNC chairman. Martin speaks about his skills as an organizer and his understanding of how to rebuild the party at the state and local level. As a representative of one of the country’s most safely Democratic districts, says Martin, Ellison could coast to re-election, but instead he’s worked hard to increase voter turnout and build the party’s strength in each election. “He’s partnered very closely with the state party and the local party committees, and he understands how important it is to build that infrastructure,” said Martin.